We arrived home from New Orleans late Friday night, we had a wonderful trip filled with lots of good food, friendly faces, plantation houses, live oaks, live music, and of course, being summer in New Orleans, some very hot weather. I will be sharing some of the highlights of our trip over the next few weeks, including some of our dining experiences. The only bad part about our trip was that I physically couldn’t eat more meals a day. We had an aggressive dining agenda that we sadly didn’t even come close to completing. For those that may be apprehensive about visiting New Orleans because CNN keeps scaring tourists away, don’t be. CNN’s job is to scare you. 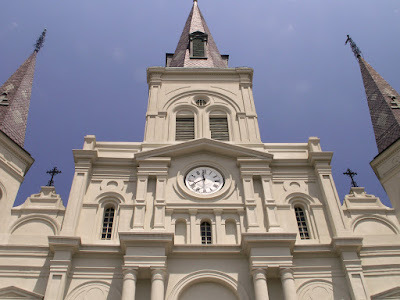 New Orleans is rebuilding, there is a lot of work to do, but the city is on the rise and it is was wonderful to see the French Quarter bustling with tourists during what is essentially the off season. It’s also good to know that there is still a guy on a street corner in the French Quarter who knows where I got my shoes. Visit New Orleans and fall in love…or maybe just rekindle the flame. Click here for more information on traveling to Louisiana. I couldn’t agree more. I’ve been down three times in the last year (I married a native…family ties are so good sometimes) and it’s been incredible to see the changes. I can only add to the encouragements you gave – Go! Get out and experience the city. I’m headed back in three weeks myself. Thanks for writing this. Good job promoting New Orleans! The media drives me crazy with all their negativity toward the city. I’ve been twice since Katrina and if you are a tourist and stay on Canal or in the Quarter, you wouldn’t even know there was a storm. It is one of the most unique, vibrant, amazing cities on the earth and the food is divine! Going back in January and I can’t wait! Hahahaha! We went to New Orleans about six months after the storm and I was so happy that somebody told me he knew where I got my shoes, I almost kissed him. Almost. I’m not totally crazy.